Summary and Definition: The "Square Deal" domestic policy was adopted by the President in which he pledged not to favor any group of Americans but to be fair to all. President Roosevelt supported progressive and aggressive political reforms, including the heavy regulation of business. His inauguration as President saw the introduction of social and political reforms sparked by the Progressive Movement. Theodore Roosevelt was the 26th American President who served in office from September 14, 1901 to March 4, 1909. One of the important elements of his presidency was the Square Deal policy. 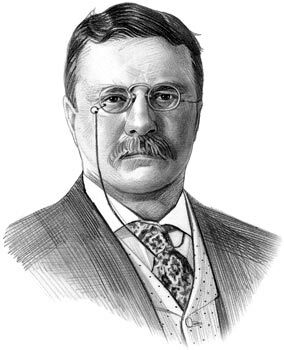 Theodore Roosevelt was highly influential during the Progressive Era focusing on efficiency and fairness. A famous Roosevelt quote was "I shall see to it that every man has a square deal, no less and no more" and he developed what became known as the Square Deal Domestic Policy that included various reform programs. Roosevelt also took on the Big Business Corporations and Trusts and advocated arbitration and conciliation to prevent conflict between the workers and the business owners. President Theodore Roosevelt was extremely popular with the American public due to his Progressive Reforms relating to Consumer protection and his passion for the conservation of natural resources and his leadership of the Conservation Movement. The Square Deal policy in relation to the Control of the corporations was an extremely important issue. Ordinary Americans and Progressives were highly critical of the power and influence exerted by the ruthless and unethical practices of the Robber Barons who headed the Big Business and Corporations. These powerful companies accumulated vast profits operating in the economic system of Free Enterprise and 'Laissez-Faire'. These massive corporations were largely free of state control or federal regulations. Roosevelt's progressive ideas and his Square Deal Policy in relation to Control of the Corporations were demonstrated during the Anthracite Coal Strike of 1902 saw President Roosevelt act as a mediator during the bitter dispute. Although he had no legal right to intervene, President Roosevelt summoned mine owners and the union to Washington to discuss the situation advocating conciliation and arbitration. He took the unprecedented action of threatening to seize mines and operate them with federal troops if the mine owners refused to compromise. Then, in 1903, Roosevelt created the Department of Commerce & Labor to settle labor disputes. His Square Deal policy in relation to the Control of the corporations continued with his “trust-busting” efforts to break up monopolies when the President took action against J.P. Morgan’s Northern Securities Company for violating the Sherman Antitrust Act. His Square Deal domestic policy also saw the passage of laws such as the Elkins Act, the Hepburn Act and the expansion of the jurisdiction of the Interstate Commerce Commission (ICC). Roosevelt's Square Deal policy in relation to Consumer protection was highly influenced by the 1906 publication of 'The Jungle' by Upton Sinclair, who was branded as a Muckraker by powerful magnets in the food industry. The 1906 Meat Inspection Act was in direct response to 'The Jungle' and initiated federal inspection throughout the meat making process. The Pure Food & Drug Act followed banning the mislabeling of foods and drugs. Roosevelt's Square Deal policy in relation to the Conservation of natural resources started in 1905 with the establishment of the National Forest Service. The National Monuments Act (1906 Antiquities Act), was aimed at the Preservation of American Antiquities. President Roosevelt then proclaimed the Devils Tower in Wyoming and the Grand Canyon in Arizona as the first of many National Monuments. The article on the Square Deal provides detailed facts and a summary of one of the important events during his presidential term in office. The following video will give you additional important facts and dates about the political events experienced by the 26th American President whose presidency spanned from September 14, 1901 to March 4, 1909.